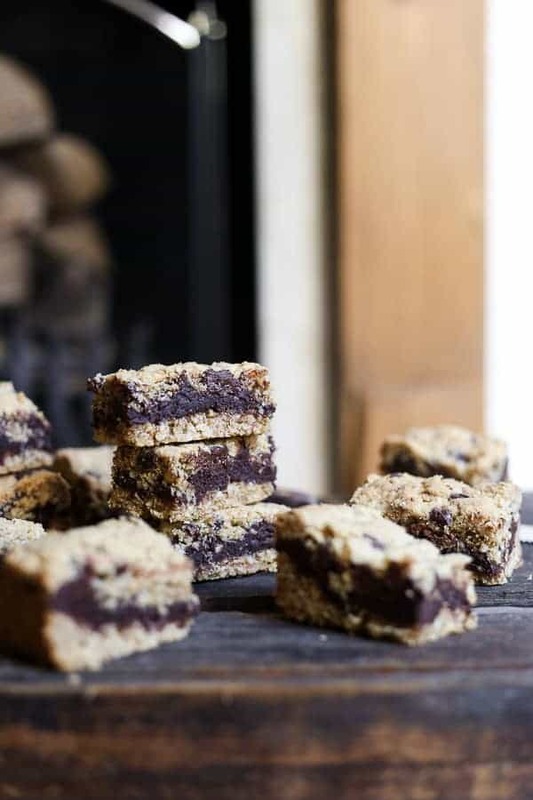 ‘Nutella’ Fudge Oat Bars are so deliciously thick and chocolatey with a gluten-free rolled oat base and an ooey gooey fudgey filling of homemade nutella. I’ve got a bit of exciting news to impart. I’m finally bouncing back from maternity leave and returning to the cake stall next month. Sunday 6th October to be exact, at Stroud Green Market, which is my neighbourhood farmers’ market. I have decided to stay local and stick to the one market for the moment to ease me back into the game. Plus I love the vibe at Stroud Green Market, it is run with a lot of passion with a lovely community feel. I will be selling the usual layer cakes, loaf cakes, bars and delectable goodies which are all totally gluten-free and incredibly delicious. For the foreseeable future I’ve chosen to not focus on jams, chutneys and other preserves which does disappoint me, but something had to give, besides my sanity. I still look after Cole and Beau for the majority of my week and I haven’t been preserving anything this year whist I’ve adjusted to two little souls to juggle. Although I expect I’ll have a few jars of something moving towards Christmas like my mincemeats or cranberry sauce. I’m very excited to be getting back to proper work and I cannot wait to dive back in. 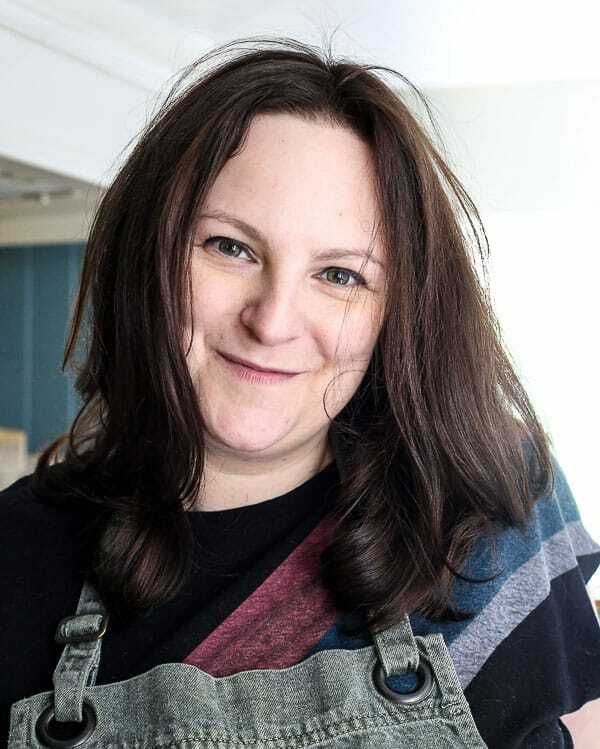 Even though I have been on maternity leave from the market stall I’ve obviously been just as busy on the blog as ever which has been a great excuse for developing new recipes for the stall. 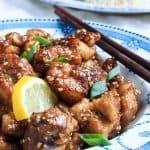 Lately it’s been a recurring theme that I have also been trying to revamp some old recipes which didn’t get as much love as they should the first time round and updating the ingredients and sometimes method to create gluten-free versions. 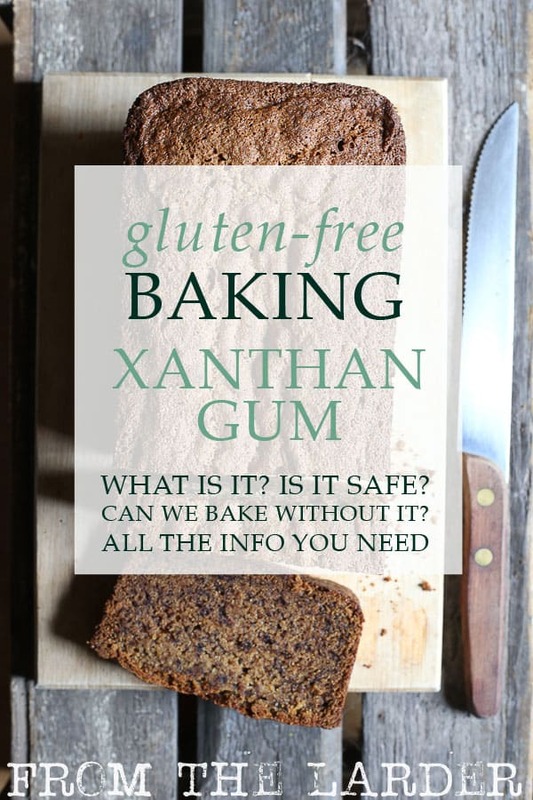 Didja know this blog is all about the gluten-free these days? 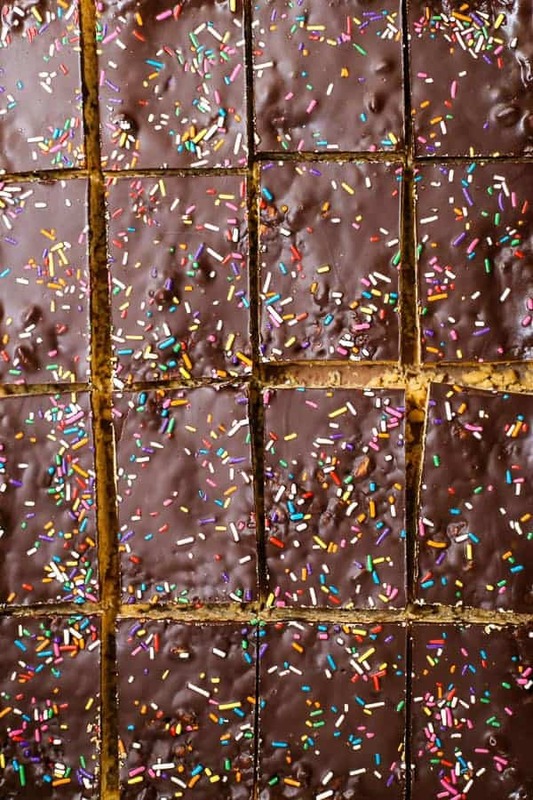 These ‘Nutella’ Fudge Oat Bars are a brilliant case in point. I posted the original recipe back in 2014 with some slapdash photos I took when I sold them on one of my first cake stalls. I’ve taken a couple of new photos but I’ve also amended the recipe to make it gluten-free and (whisper) remove the Nutella. There’s something about the ingredients list in Nutella that I’m not quite on board with these days, all that palm oil and sugar doesn’t sound very appealing. But the good news is this version is so much better with a more intense chocolate and hazelnut flavour. 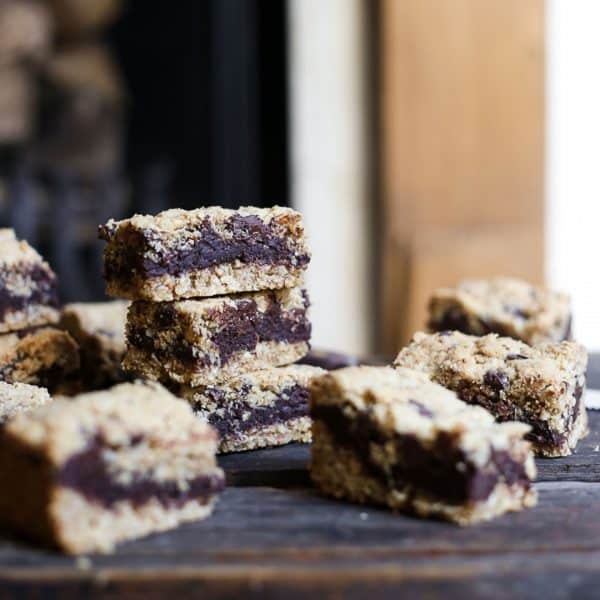 Homemade Nutella is pretty darn spesh and here I’ve used a natural hazelnut butter, melted dark chocolate, cocoa powder and a smattering of brown sugar to make the most amazing filling for these oat bars imaginable. 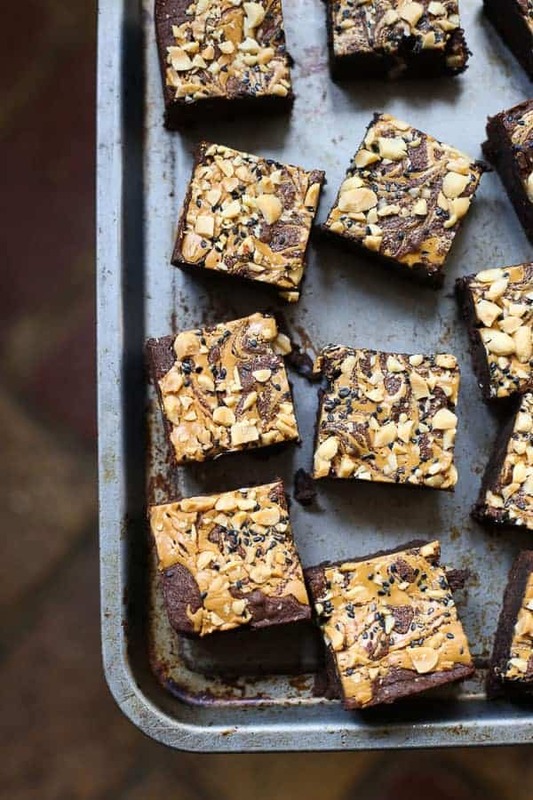 The evaporated milk added in at the end is what transforms this incredibly chocolately nut butter into creamy gooey fudge. 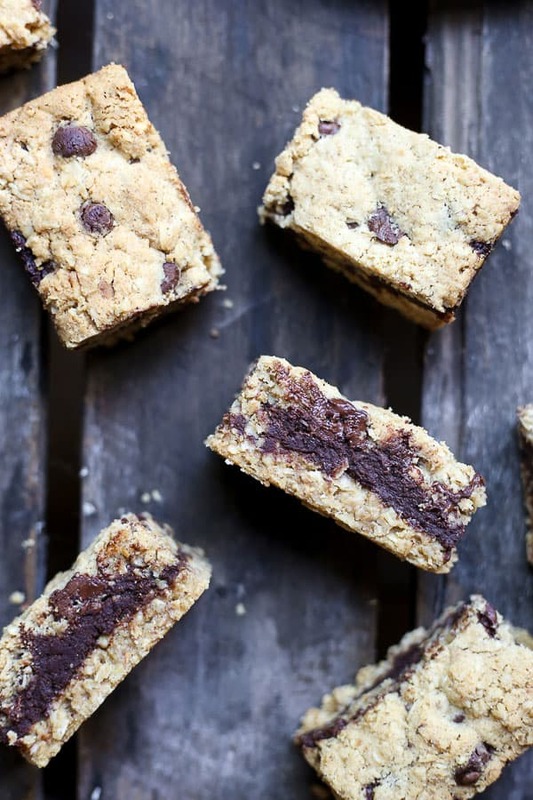 The rolled oat biscuit crust which holds it together is buttery and crumbly and studded with chocolate chips on the top, because if I can add more chocolate to a recipe then I will. 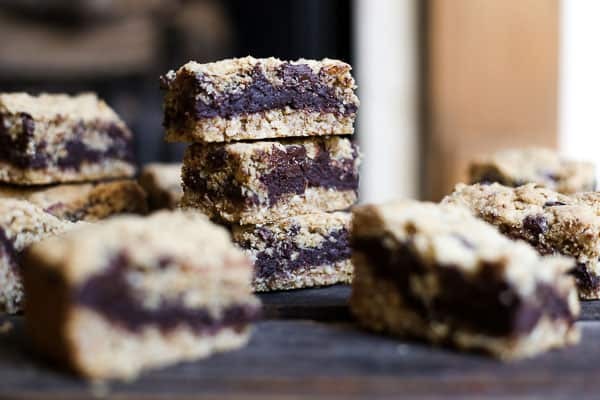 I’m really looking forward to introducing these 2018 versions of the ‘Nutella’ Fudge Oat Bars to the cake stall. They represent the fully flavoured bakes I love to produce with the best quality gluten-free ingredients. If you live in London or are visiting for the weekend then I’ll be at Stroud Green Market every Sunday from the 6th October and I’d love to see you. I’ll be the one surrounded by a lot of cake. Pre-heat the oven to 160°C and grease an 8 inch square baking tin. Whisk the sweet rice flour and tapioca flour together until combined. 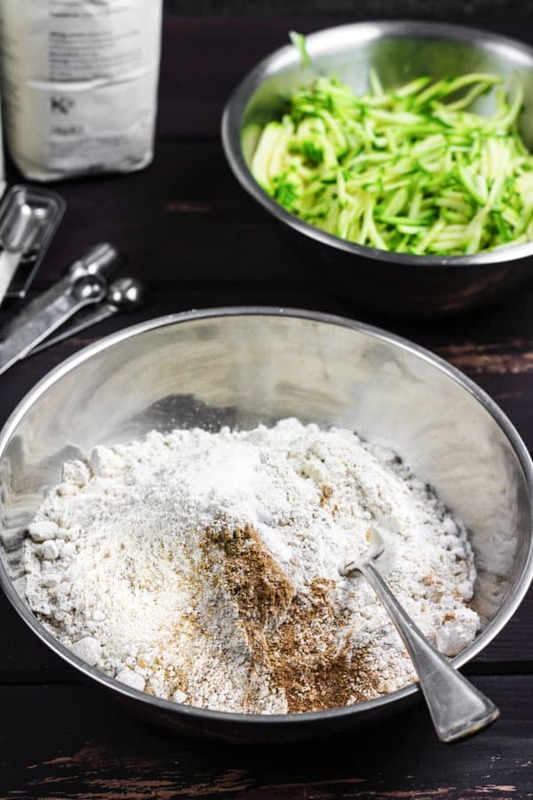 Add the oats, hazelnuts, butter, sugar, baking powder and salt and rub together with your hands until everything has come together to form a light dough. Melt the chocolate, hazelnut butter, cocoa powder and evaporated milk together in a double boiler, mixing together until thoroughly combined. Spread the ‘nutella’ chocolate mixture on top of the first layer of dough. Add the chocolate chips to the rest of the dough then crumble the dough on the top and press down lightly into the chocolate, don’t worry too much about it spreading out evenly. Bake in the oven for 35 minutes until the top is golden brown. Remove from the oven and leave to cool for an hour or so before removing from the tin. Leave to cool completely on a wire rack before cutting into bars. for years and it’s always served me really well. 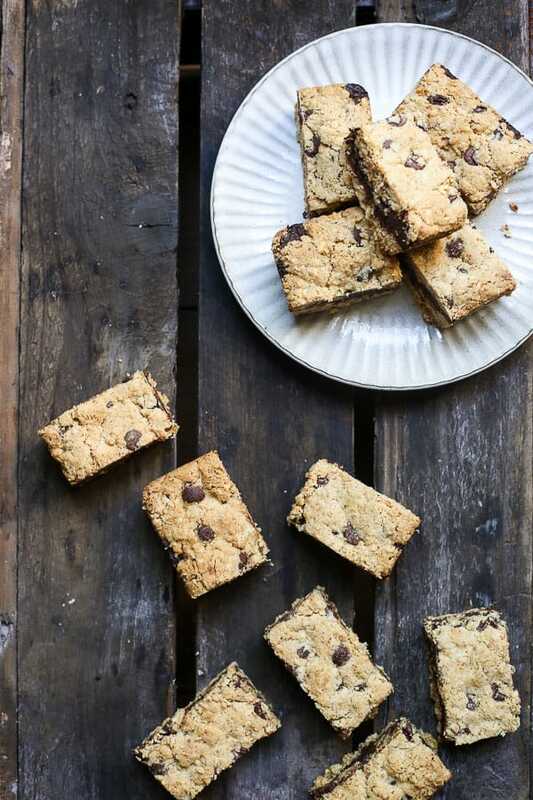 It has a loose base so it’s really easy to remove these oat bars from. My favourite of all the gluten-free flours finally receives its moment in the sun with its very own chapter in my Gluten-Free Flour Series. Ladies and gentlemen, I give you… Oat Flour. First a caveat on oat flour. Oats themselves are gluten-free but are often processed in mills with other grains so there is a lot of cross-contamination. If you are gluten intolerant or coeliac you must make sure it’s certified gluten-free on the label. 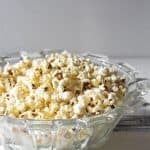 It’s also the unfortunate fact that some coeliacs and people with a gluten intolerance just simply can’t tolerate oats at all whether they are processed in a gluten-free environment or not. So always check with whomever you are baking for that oat flour isn’t on their black list. Oat flour carries the same benefits as oats themselves which are delicious and nutritious. They are high in a fibre called beta-glucan which helps lower cholesterol, supports your immune system and contributes to fight hunger pangs. The soluble fibres are also considered to lower blood sugar by reducing glucose absorption meaning oats are especially beneficial for diabetics. Oats are also good for your skin which is why you see oatmeal added to lots of skincare products. 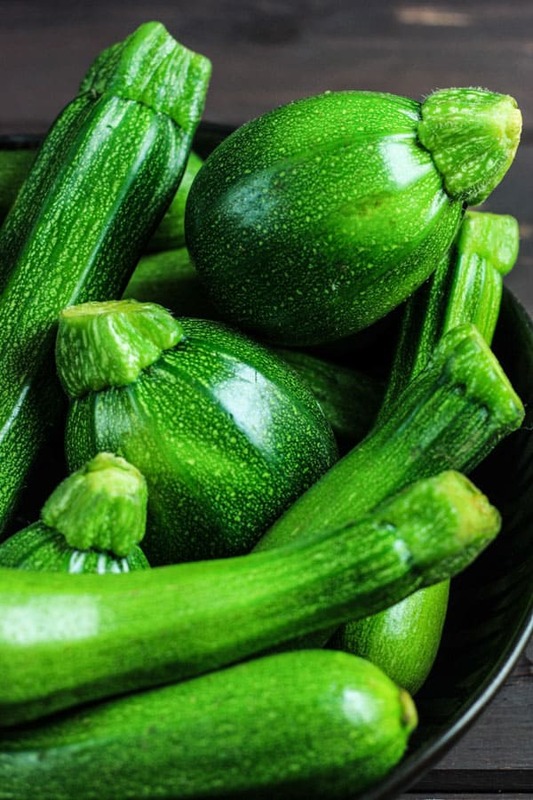 They are high in protein compared to other grains and are a good source of magnesium too so assist in energy production. 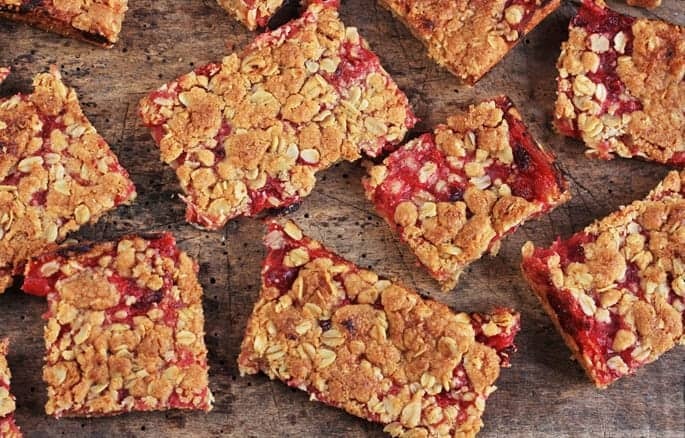 However, this is all just bonus material as oats also taste terrific which is carried through into your bakes and also add texture from beautifully fluffy bakes to flaky pastry. Oat flour is basically very finely ground oats. You can easily grind oats yourself to make oat flour but the finer the grind then the fluffier the cake which is why I buy commercial oat flour. However on the very regular occasions which I run out then there is a negligible difference in the homemade version. It’s also the much cheaper way to go. 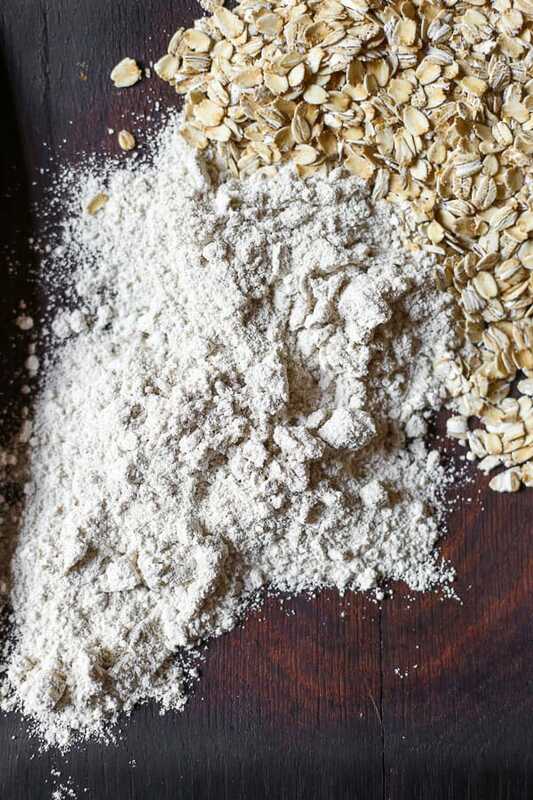 Oat flour is simple to make as all you are required to do is bung a heap of jumbo rolled oats destined for your porridge into the food processor and turn it on. Within about 30 seconds you will have a beautiful oat flour. If you need a specific amount for a recipe then the ratio is 1.25:1 jumbo rolled oats to oat flour so to make 100g of oat flour then you will need 125g rolled oats. 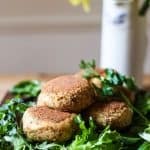 Can you substitute wheat flour with oat flour? Now, when I say oat flour is my favourite flour that is not because it is the most versatile. Nor does it provide a direct 1:1 substitution with wheat flour as it barely mimics any properties of plain wheat flour. Plain wheat flour is so ubiquitous because it does so many jobs that you might need two or three alternative flours to complete. A lot of its work lies in holding things together, crisping or fluffing. Wheat flour also has a neutral taste so can sit well in any meal or bake without imparting any distinct flavour. However, what makes alternative flours so much more interesting and more complicated to understand is their unique profiles. 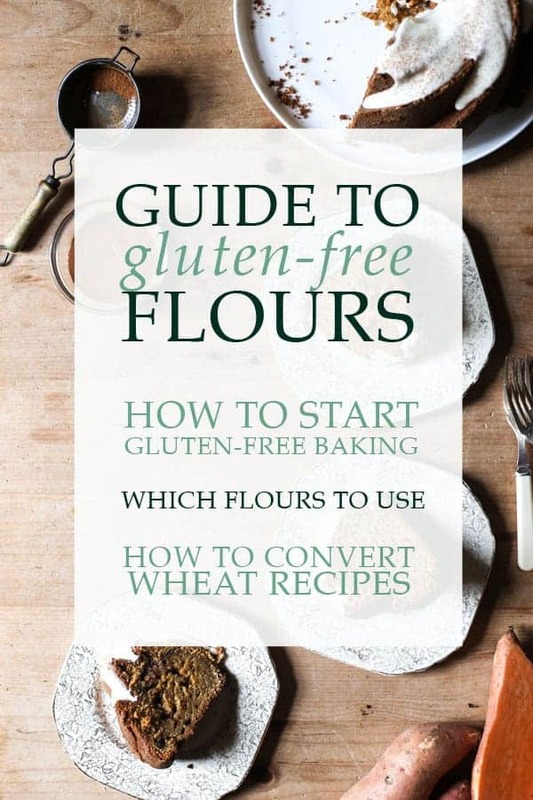 There isn’t a go-to gluten-free flour, each one brings its own characteristics and ‘role’ to your meal or bake. 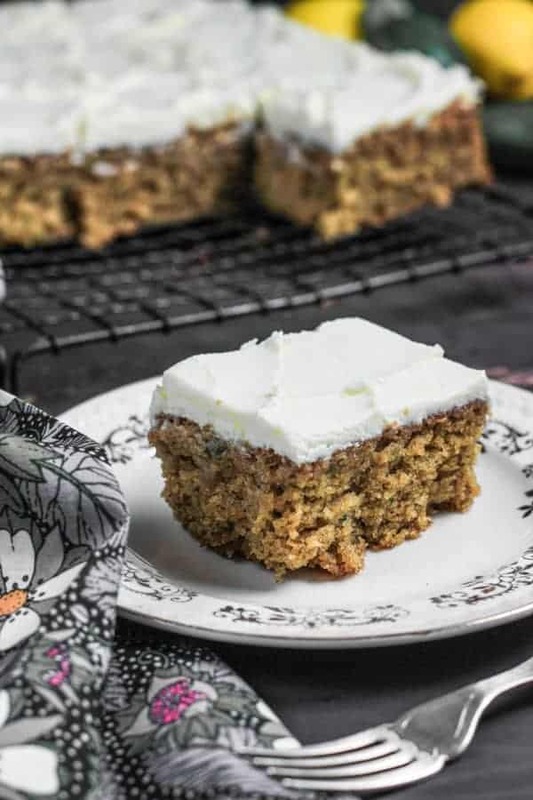 It is possible though to create bakes using merely oat flour, although the results will not be as robust as using wheat flour. 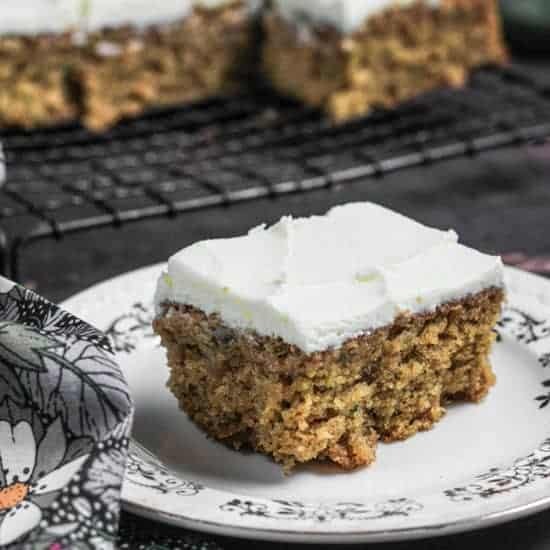 A delicious cake using just oat flour will need a lot of hand holding with its other ingredients, you will probably need more eggs than a regular recipe to help the cake to rise. However, it will produce a delicate elegant result. 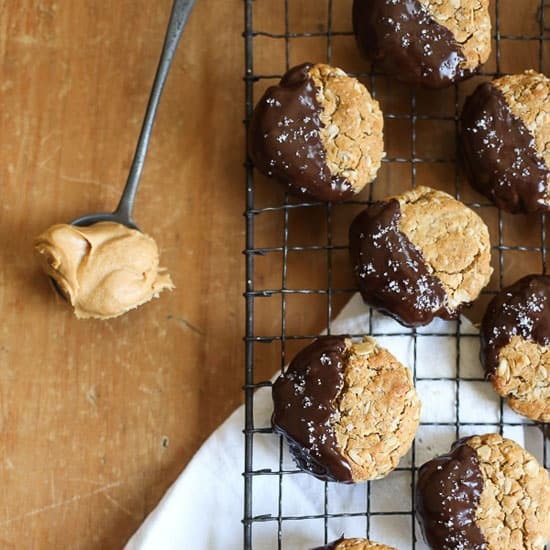 Using oat flour by itself can also be very successful in cookies and biscuits. 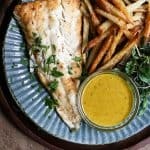 However it’s best to not substitute wheat for oat flour in any old recipe but to seek out recipes which are specifically produced with just oat flour in mind. 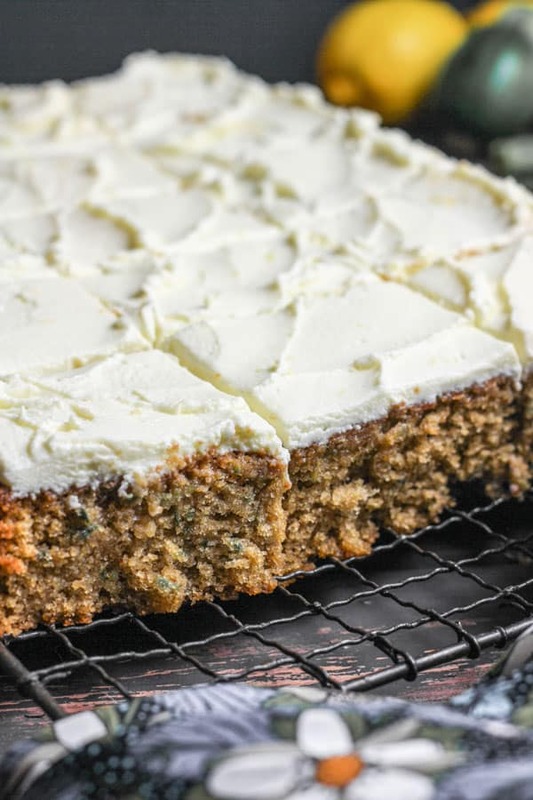 There are many alternative flours out there so why might you choose to use oat flour in your gluten-free cakes and bakes? The reason would be for the bags of personality that oat flour brings to the table. There is none of this neutrality that wheat flour carries. 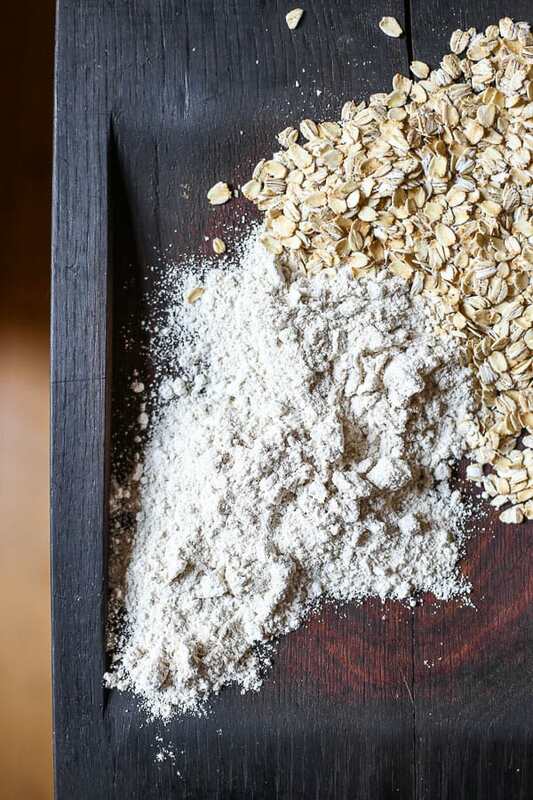 Instead oats are imbued with a deliciously toasted butterscotch flavour which is almost sweet and pairs so beautifully with so many flavours and gives a lovely background note to your bake. It’s distinctive but doesn’t overpower. 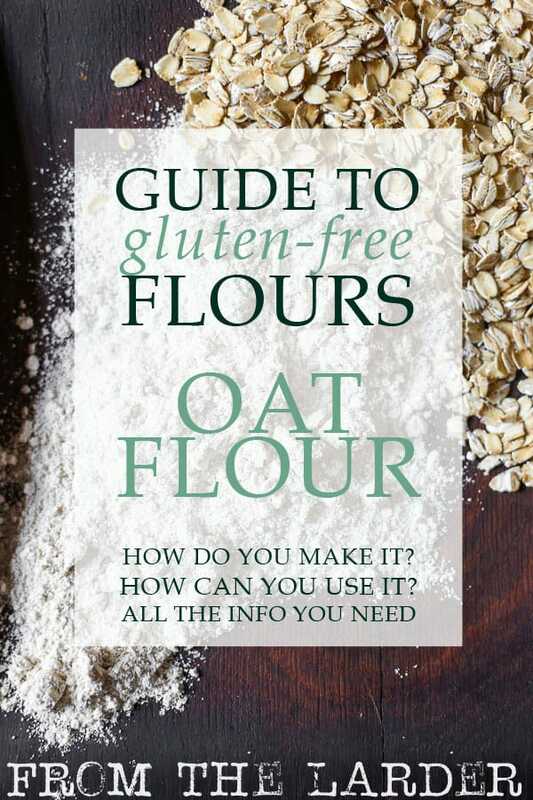 Oat flour is also higher in protein and fibre than many other alternative flours which means it gives a lovely soft texture to your bakes, it fits perfectly in a homemade gluten-free plain flour blend as it works so well with other alternative flours. 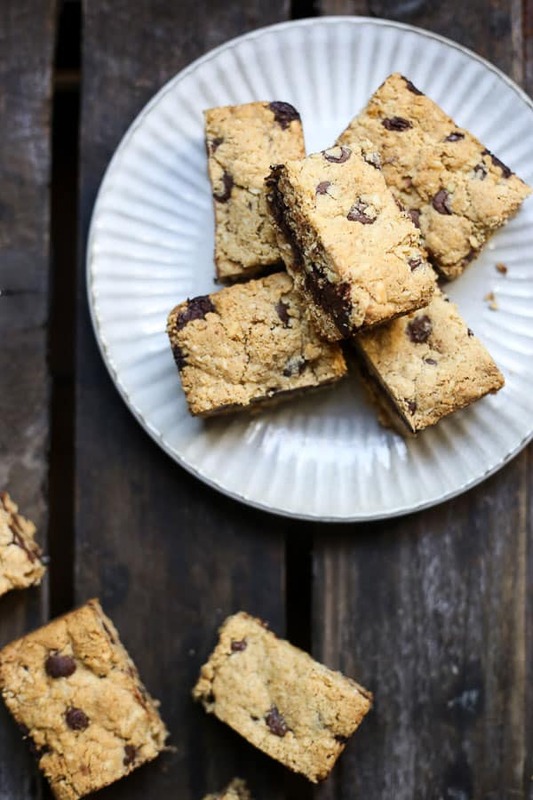 How do you use oat flour in baking? 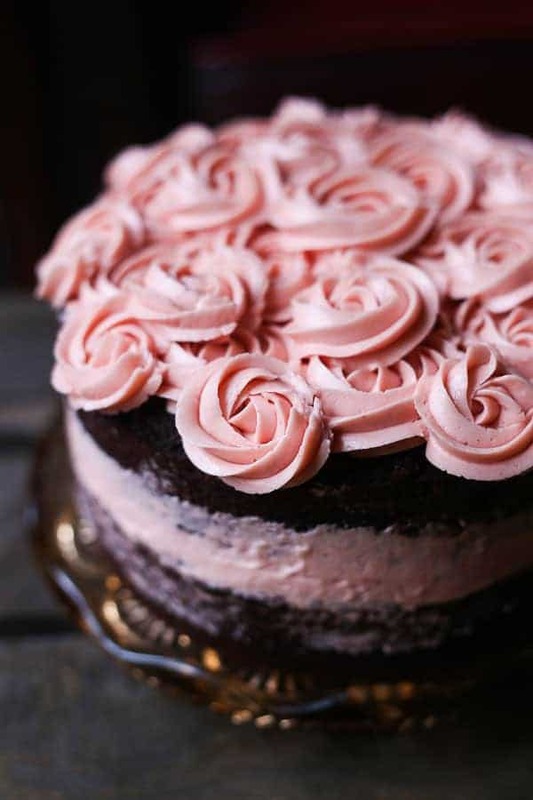 There are lots of recipes which benefit from the inclusion of oat flour. 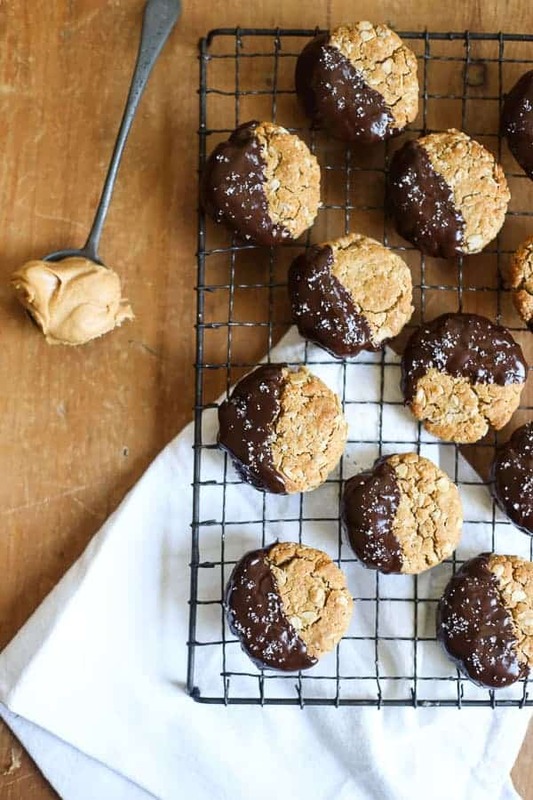 In particularly cookies, making them beautifully chewy. Oat flour also works well in crumbles or crisps due to its crumbly chewy nature. Oat flour can be put to excellent use in a gluten-free all purpose flour mix and I pair it a lot with white rice flour and tapioca flour which can be substituted for wheat flour in most recipes. 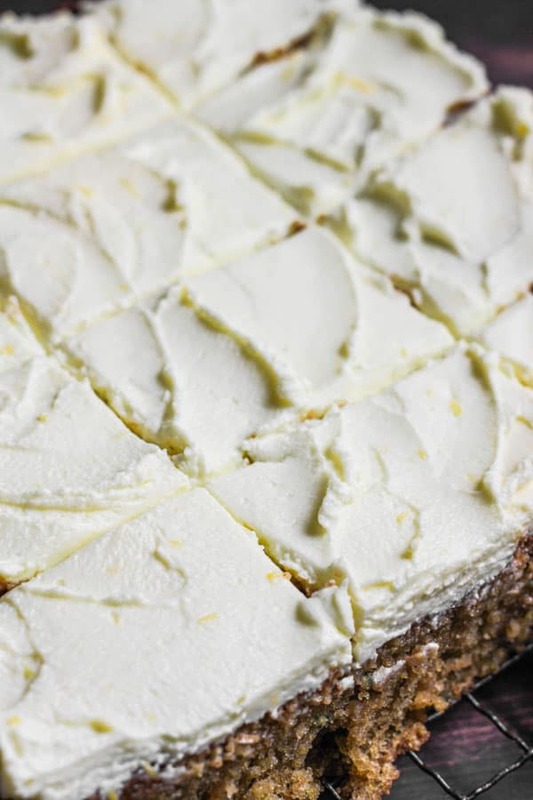 The rice flour gives the bake a structural integrity but the soluble fibres of the oats gives the bake a softer quality and negates the grittier properties of white rice flour. The tapioca is an excellent binder and mimics some of the gluten properties of wheat. 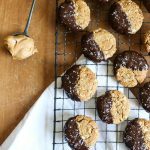 What flavours pair well with oat flour? Take your pick, this is such a versatile flavour. Although its nutty toffee-like tones are an especially good match for chocolate, caramel, vanilla, nuts, spices, stone fruits, berries, bananas, apples, squash and coffee. 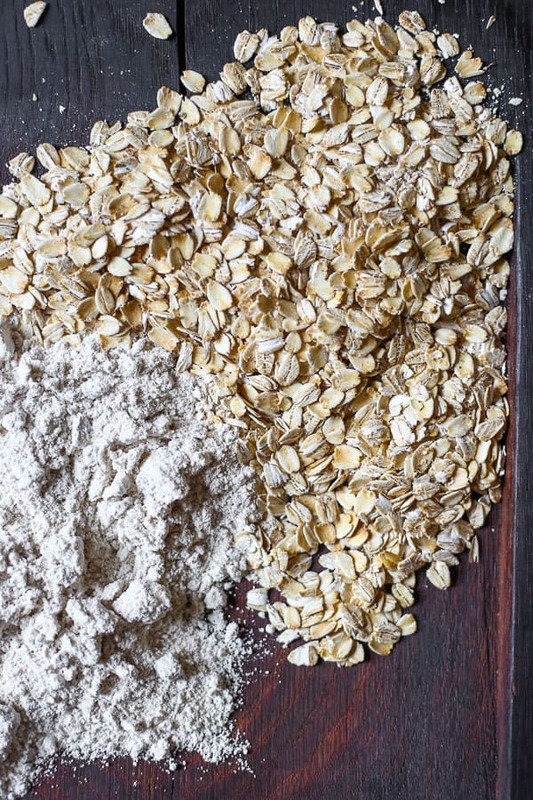 Where can you buy oat flour? when I want to grind my own oat flour. 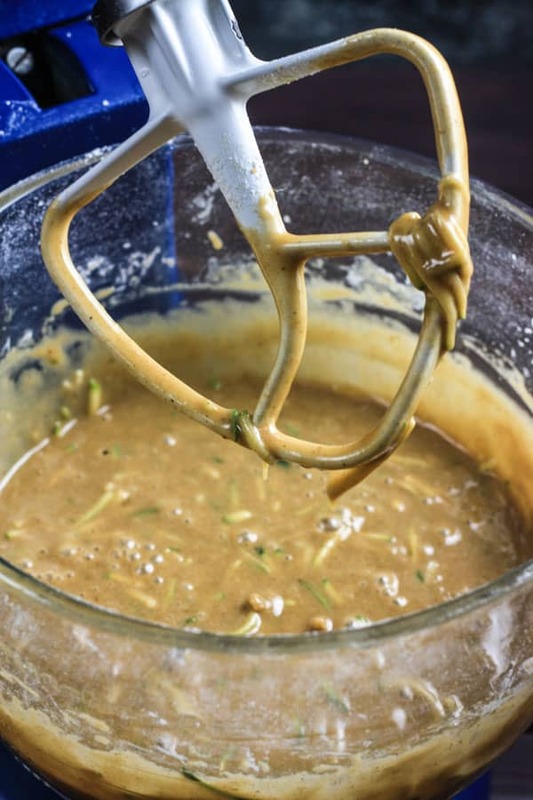 I have easily had it over ten years and I use it nearly every day for all manner of kitchen jobs like whipping up dips, pestos, nut butters and flours and making my breadcrumbs. The Magixmix is an impressive piece of kit which even survived being dropped when we moved into our house (although it did have to have the motor replaced but that wasn’t too expensive). I put all the attachments in the dishwasher and they come out brilliantly clean but it also gives just great results. I love my Magimix and along with my Kitchenaid is the piece of equipment I use most often in my kitchen. 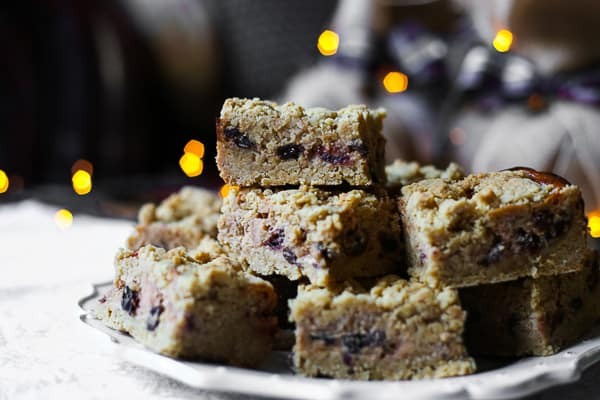 A thick layer of rich fruity mincemeat cheesecake sandwiched between crumbly oaty shortbread. I am finding it hard to fit in all the exciting Christmas inspired bakes and recipes in my usual 1-2 blog postings per week. So from here on until Christmas I’m stepping things up a notch. I do love to over exert myself, especially where food is concerned, so expect a bumper month of posts. I’m hoping to mix in a bit more savoury stuff into this advent period as well so let me know what you think of that. 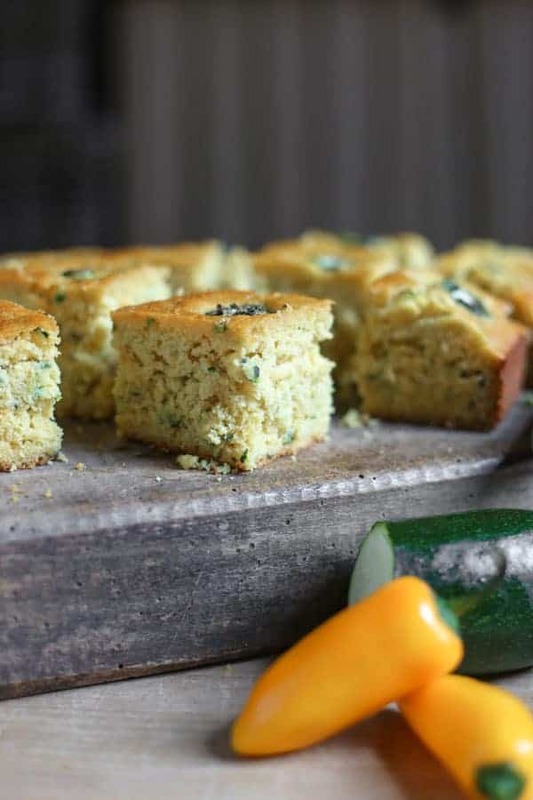 A lot of people have been saying that they missed my savoury recipes this past year where I have been more or less baking focused so in 2018 I’m planning on throwing in a few more gluten-free dinner ideas for good measure. As usual I have set myself too much to do in the run up to Christmas, especially since Amazon have very destructively added the first series of The Marvellous Mrs Maisel to their streaming service this past week. So now I must endeavour to fit that in as well amongst the Christmas cards, extra cake orders, food prep and shopping for more Thomas the Tank Engine stocking fillers. Still, I can’t help but love December!! It may be apparent to the eagle eyed reader that I am an ardent devotee of mincemeat. 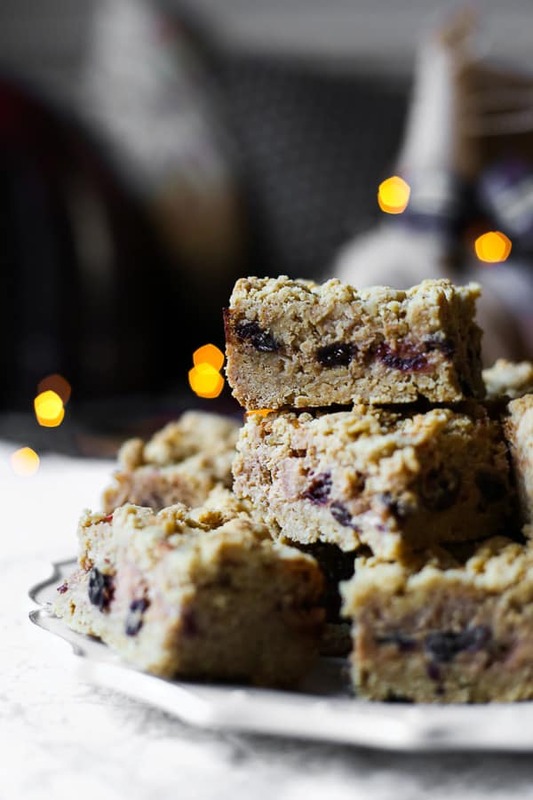 I try and put mincemeat in most of my bakes around December and a couple of weeks ago I made these Mince Pie Cheesecake Oat Bars for the market stall and have decided that they might be one of my best inventions yet. 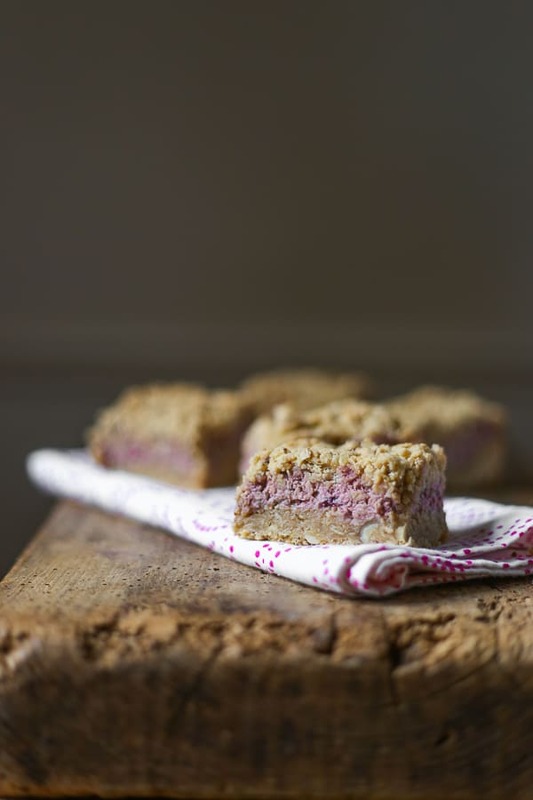 They are a riff on my Blackberry Cheesecake Hazelnut Oat Bars. 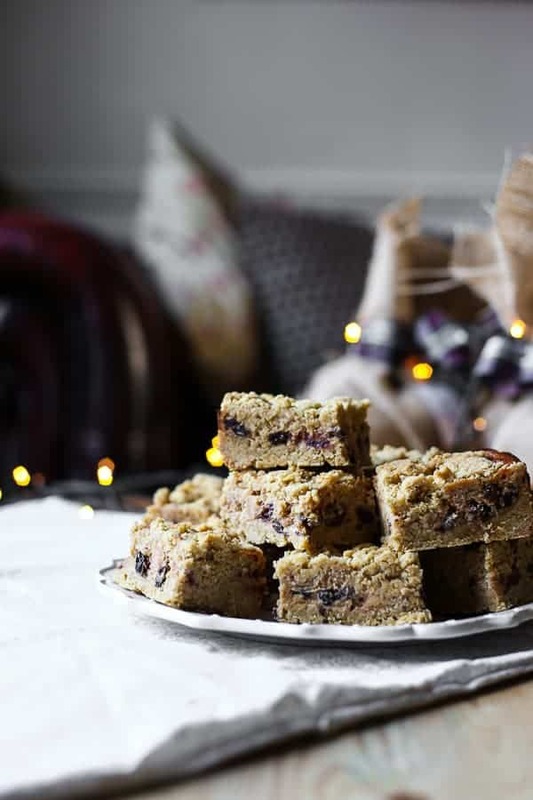 Two layers of oaty shortbread are sandwiched together with mincemeat cheesecake. If you are buying your mincemeat for the recipe then do make sure it’s suet-free as you don’t really want any extra fat messing up the recipe. I used my Cranberry Cointreau Mincemeat which is perfect for any kind of baking. 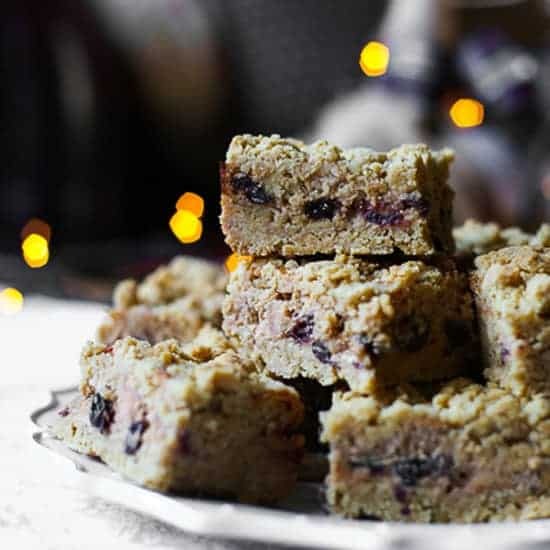 By mixing the mincemeat with the cheesecake mixture you are making the centre of these oat bars extremely creamy. They don’t have the sweet punch of a traditional mince pie and are more of a subtle affair but still packed with that rich fruity spice flavour that is key to any mince pie creation. In a medium sized bowl stir the cream cheese, mincemeat and eggs together until well combined then set aside.